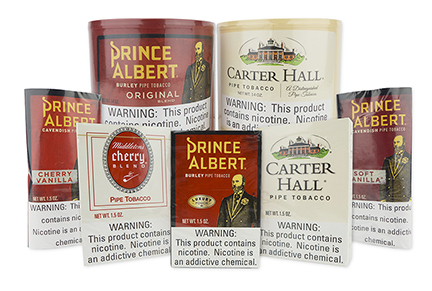 Purchase 6 canisters of your favorite Middleton tobacco and receive 5% off! Purchase 12 canisters and receive 10% off! Special Note: If you enjoyed Middleton's Kentucky Club Mild, Kentucky Club Mixture, London Dock, Royal Comfort, Sugar Barrel, or Walnut pipe tobaccos before they were discontinued by the manufacturer, we invite you to try Milan Tobacconists' "Our" blends by clicking the respective links below. We produced these blends with the support of our wonderful customers who smoked the originals for decades and volunteered to critique every blend variation we sent their way for testing. Slow burning, no bite. Cross cut Burleys with a sprinkling of Virginia flake. A pleasingly sweet taste and aroma. A long-burning crimp cut. A traditional non-aromatic mellow tobacco taste. The standard in Burley blends since 1907. Crimp and shag cut Burley with flakes of Golden Virginias and a touch of Black Cavendish. A smooth and mild smoke combining cherry and vanilla flavor impacts. Burley, Virginias, and Black Cavendish combined with soft and sweet vanilla and a complex fruity background. Smooth, mild, and cool. It tastes as great as it smells.